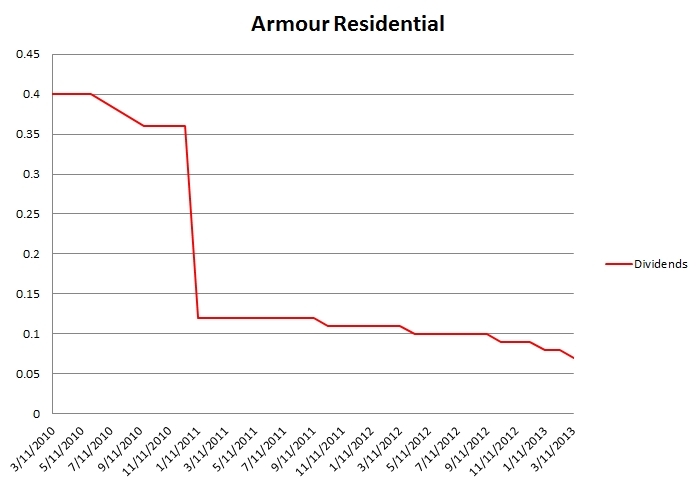 Armour Residential (ARR) cut its monthly dividend to $0.07/share from $0.08. It’s the 2nd cut in as many quarters and the price dropped. For me it is the end of holding this stock. This morning I sold my shares in ARR and I am no longer interested in this paper. Now I will be looking for a replacement of this stock. Most likely I will invest in Realty Income or similar REITs stock. However, I may also buy a completely different paper. I held ARR since March 2011 and enjoyed nice dividend income. the company started with 0.40 annual dividend in 2010 and today ended up with 0.07 annual dividend (forward yield at 12.7%) Although it may sound still good, the price hit makes this investment worthless. Closing this trade would remove $388 in annual dividends. Unless I find another high yield investment this trade will get me farther away from my goal. But i would rather get smaller payout than seeing my holdings being plundered because of dividend cuts. Although the price of ARR dropped by another -2.99% my trade wasn’t a loss thanks to the dividends I received. I didn’t gain much too, but at least I am getting out break even. Selling at $6.56 a share I made $25 dollars net gain (0.84%). Sfi, thanks for the tip. I have heard about preferred stocks with mREITs but I have no experience with them. I will take a look at it and give it a shot. The way to play mReits is with preferreds. No equity risk and high yield. These companies are solvent just volatile. I bought ARR-A (series A preferred – 8.25% qualified yield) when it came out last year. The 8.25 % yield is qualified, which means that (for me anyway) it’s equivalent to a fully taxable common yield of 9.5%. Not too shabby. Oh it also pays a monthly dividend!